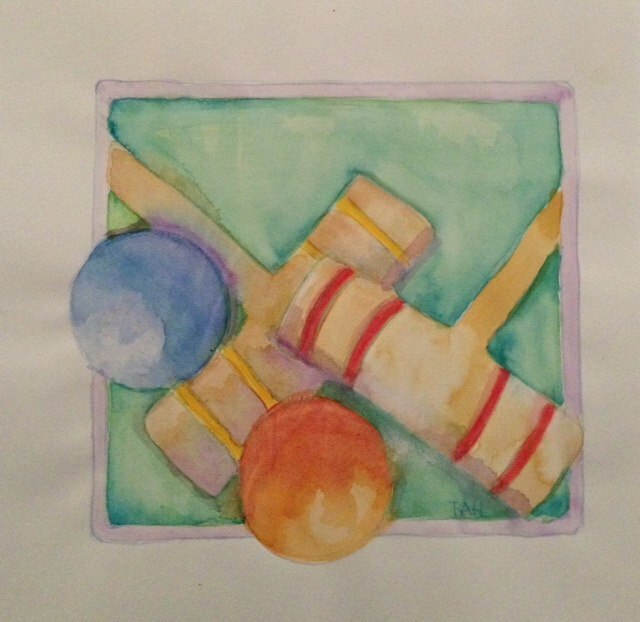 Croquet Tournament Coming September 28, 2019! The T-Shirt Design for the event in 2014. The 1st Annual Alexander Graham Bell Croquet Tournament was held on Saturday, September 21, 2013 at the historic Bell House Bed and Breakfast Inn at 821 Irving Avenue in Colonial Beach. It's the former summer home of telephone inventor Alexander Graham Bell and that's why the tournament is named the way it is. Inn Owner Anne Bolin graciously opened her beautiful home and grounds for this fun fundraising event. Nine hoop (wicket) was the game played that day with tourney founder and director Thomas Savage enforcing the rules. 25 players paying $25 each were on the two 50x25' half courts on the Bell House's back lawn to raise money for the Colonial Beach Volunteer Fire Department. There was a lunchtime break with delicious food catered by Denson's Grocery and music performed by Steve Griffin and John Murphy. Approximately $1,000 was raised and Les Heflin walked away with the game-winning trophy. Additional parking was provided at the large lot on the corner of Marshall and Nelson by the Colonial Beach Lions Club (now the Community Center) and the folks at Ingleside Vineyards brought a fine selection of their wines. The sport dates back to the mid 1800's originating in London, England. Each country has their own rules and playing styles. The most common in the U.S.A. is the nine-wicket game. The object is to advance colored balls through the course by hitting them with a mallet, scoring a point for each wicket and stake made in the correct order and direction. The winner is the first side to score the 14 wicket points and 2 stake points for each of its balls, unless the game is played to a time limit. The 2nd Annual Croquet Tournament took place on Saturday, September 20, 2014 and the 3rd happened on September 12, 2015. The 4th Annual was on September 17, 2016. The event sometimes shares the same weekend as the big Wine and Oyster Festival at nearby Stratford Hall Plantation, home of the Lees.